Heat 2 tablespoons of the olive oil in a large sauté pan over medium heat. Add the shallots and sauté until softened (about 5 minutes). Add the cranberries and continue to cook, stirring, until they are softened and begin to pop (about 5 minutes). Set aside to cool, then transfer to a blender. Add the vinegar, rosemary, sage, water, maple syrup/sugar, salt, and the remaining 2 tablespoons of olive oil and process until smooth. Wrap the beets in aluminum foil and put them on a baking sheet. Put the fennel on a separate baking sheet, cut side up, drizzle with olive oil, and season with salt and pepper. Roast the beets and fennel in the oven until fork-tender (about 30 minutes for the fennel, and 50 to 60 minutes for the beets). When cool enough to handle, peel the beets and cut them into thin slices. Cut the fennel into very thin slices. Meanwhile, spread the pecans on a baking sheet and bake until lightly toasted (about 5 to 8 minutes). Put the arugula (rocket) in a large bowl; add the beets, fennel, nuts, and optional pear, and gently toss together. Drizzle with the dressing and scatter the figs over the salad. Alternatively, divide the arugula evenly among salad plates, placing it to one side of the plate. Drizzle with the dressing and scatter the nuts on top. 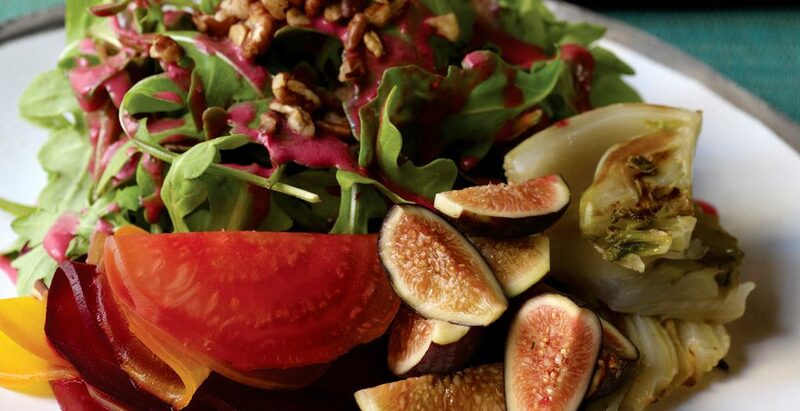 Arrange the beets, fennel, figs, and optional pear alongside the arugula and serve at once.